I had heard about how fun it was but was concerned about a possible decline in booty-shaking skills as I have not had to do much real dancing, the kind that will make you sweat, leave you sore, and cause you to need to take "water breaks" (read: excuse for stopping before having a heart attack on the gym floor) in a long time. Truth be told there was a steep decline in booty shaking skills from my drill team days. In my head I was unleashing my inner Beyonce but in reality, I looked more like Urkel. My mind was willing but my muscles are flesh was weak. But here's the thing: it was a charity event and our battle cry is "Anything for Anthony" and humiliating myself by doing Zumba falls under the "anything" category. Plus it was fun. Really fun. Oh Zumba. It scares me. I can't even keep up with a plain old aerobics class. 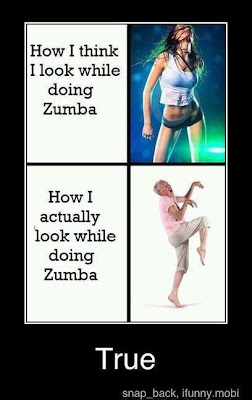 I sometimes watch those Zumba ladies and I can't figure out how they know what to do. I am always so impressed with them. Somehow this comment was deleted before ever being published: "A zumba place just opened down the street from me - well, around the corner and down that street, anyway. Every now and then, I see them doing a class(?) as I'm driving by on my way home. Looks like fun - I wonder if they have any classes for out-of-shape, middle aged people. . . :)"